Chez Reynella loves camping. Getting to the campsite, now that can be a very different issue. This time, everything went relatively smoothly, with the exception that the stop at the major Fast Food restaurant, the bribe for good offspring behavior, didn't materialize for some time so there was much mutiny in the ranks (and when we stopped, there were massive delays being served, so much for Fast Food). We finally made it to the Sandy Creek Youth Hostel, one of the YHA Bush hostels you can book as a group. Chez Reynella was one of three families sharing a weekend bush adventure. A velvet sky stretched overhead, dazzling with stars. Inside, we had a massive communal cookup, played board games with the kids, and went spotlighting for wildlife (two kangaroos and a possum were seen in the immediate vicinity of the house). After all this excitement, I unpacked my cameras and portable refractor for some serious astronomy. This is Scorpio, taken with my Olympus [mju:]300 digital (click image to enlarge for better viewing). The camera was tripod mounted, in nightshot mode and triggered remotely. The exposure was roughly 6 seconds long. Click to enlarge. The colours of the stars are rather vivid in this image, I suspect this has more to do with the camera sensitivity than the actual colours of the stars. 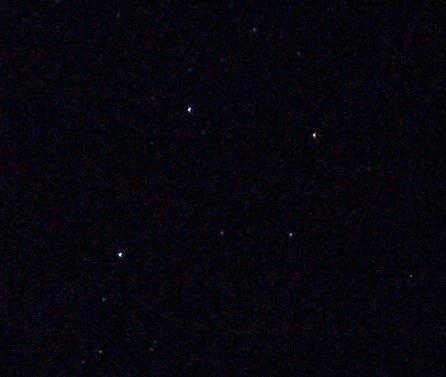 The star clouds of Scorpio and Sagittarius were clearly visible in the sky, but don't turn up on this image. Well, given it was only a 6 second image, it's not surprising. I'm a bit envious of other digital camera owners who can specify the length of their exposures, although without a clock drive, anything over 10 seconds shows perceptible star trailing, so it's not too much of a gain. This is a more detailed look at the tail of the Scorpion, take in SuperHigh Quality mode (click image to enlarge for better viewing). 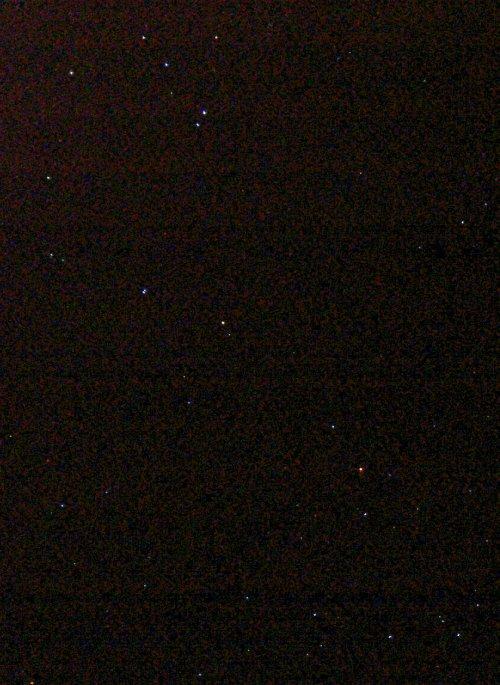 The False Comet (or Table of Scorpius) is just visible, and if you have a lively imagination you can just see Ptolomey's cluster just off the tail. I then unpacked the trusty SLR, and set up some 10-15 second shots. It will be a while before I can get these processed, as there is only one camera shop in Adelaide that I know of that still does manual printing of film. The automated machines can't detect the edges of exposures taken at dark sky sites, so they can't develop them. I then set up a several hour star trail exposure. Unfortunately, the clouds moved in after half an hour and I had to shut down. Well, I've finally sorted out the problem with getting the same location twice in a row, so here is the Celestia Script for viewing the conjunctions on 30 September and 22 October of Earth and Venus, Jupiter and Mercury and finally Mercury and Earth (see this post for links to the Celestia program). The script is a little kludgy, and could use a little tidying up (you might want to turn off labels after the initial identifcation of the planets, and you might want to tune the "wait" commands tp cope with the speed of your computer). I've also got the definition file for 87 Sylvia and its two moons to download as well. The ABC online has a story about the August 24 auora as seen from Gippsland. Also, pop into this stunning site for real time whole sky images from the south pole. Click on August 24 and scroll through some amazing images. After a long and arduous Journey, Spirit has finally reached the summit of Husband Hill, the highest peak in the Columbia Hills range. In this view a distant dust devil spins across the plain. Hopefully some more panormatic views will be forth coming. Spitit has lasted 582 days, far logner than it's original 90 day-estimated lifespan, and produced some exciting science. Spirit will now do some weather observations before heading downhil to some interesting layered terrain. For more detailed reports see Nature and Sky&Telescope. 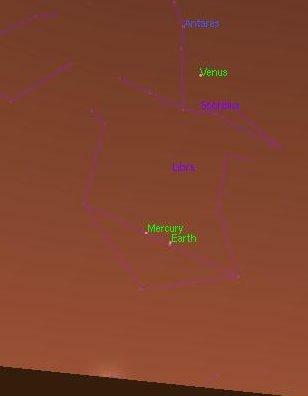 As I have mentioned before, on September 1 there is a conjunction beteen Jupiter and Venus. 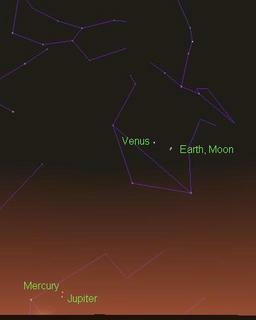 On September 30 is another conjuction, of Earth and Venus, but you have to be on Mars to see it. There is also a conjunction between Jupiter and Mercury, although this is low to the horizon, and you might not be able to see it for dust. There's a chance this could be imaged by the Mars Rovers. 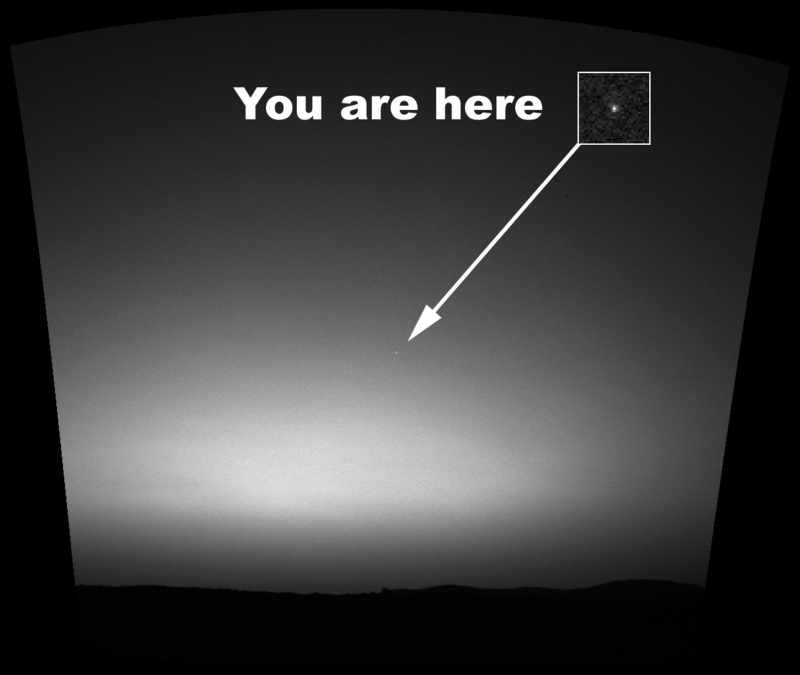 Spirit has already taken one shot of the Earth in the Martian sky. If you look closely at Earth on the image (as always, click to enlarge, it's the Martian Sky about 20 minutes after sunset), you can see the Moon next to it, whether Sprirt could pick up the Moon in an evening shot is unknown to me. The image was generated in Celestia. As I've said before, I love Celestia. It can take you to other worlds and let you see what the skies look like from there. I've almost finished a Celestia script (yeah! right! Like all the others you've promised you say) to run through the days before and after the conjunctions, but I'm having troubles getting the camrea to return to the same lat long when you run the script twice or more. We Southern auroraphiles are still recovering after last nights spectacular (well for most of us, it wasn't as visually impressive compared to the great shimmering sheets of colour seen in more southerly regions like Tasmania (see above) where red rays shot up to the Zenith, but it was visible over a big chunk of Australia, and it lasted a heck of a long time, one of the longest auroral events I know of). The Bz reading went down to -60 nTelsa at one stage. There is a good thread on the aurora on the Ice in Space Forum with some great pictures. However, it doesn't seem to have been reported much in the mainstream media, nothing in the Age, and a short report on ABC online. New Zealnd Observers seem to have seen more spectacular views, but weather was a problem at a lot of sites. As you know, I saw only a faint whitish glow on the souther horizon. 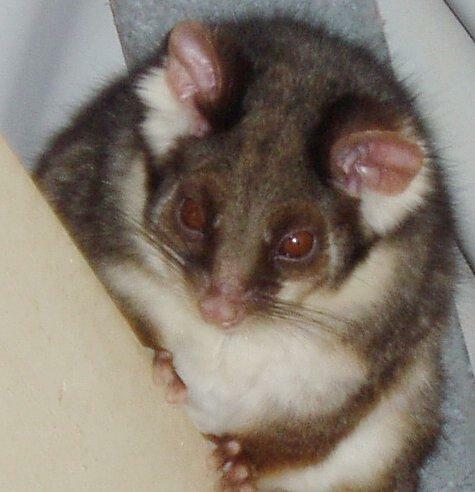 Other Adelaideains, observing from darker skies, saw beams, rays, and the occasional faint curtain. It might have been nice to go out to a dark site, but I was minding the kids, and Smallest One gave me a really fantastic cuddle, so it was not so tragic. As I write a geomagnetic storm still rages here in Australia and New Zealand. The first of the Coronal Mass ejections hit us around 4.00 pm local time, by 8.00 pm the storm was raging, instruments were emailing me warnings and Gordon Garradd snapped this image of aurora from The Warrumbungles in northern NSW. So the storm had to be good. At its peak, we had a K-index of 8, with a Bz of -26 nTelsa (ie a BIG storm). This was somewhat unexpected given that the CME's were really directed dead on to us. I was still getting reports at 11.00 pm local time. What did I see? Well, I thought I saw nothing until I checked during a lull, the whitish glow to the south that I though was due to the city lights had gone, so I might have seen my first aurora! Not exciting visually, but a red-green colour blind person trying to see a faint red glow has a hard time of it, so I'm satisfied with a whitish glow. Walking home this evening I had a taste of treat early evenings hold for us over the next week. 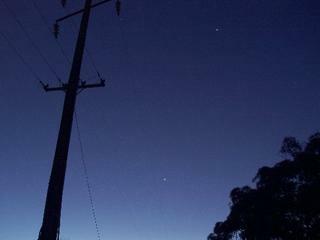 Jupiter, Venus and Spica hanging togeter in the gatering twilight. 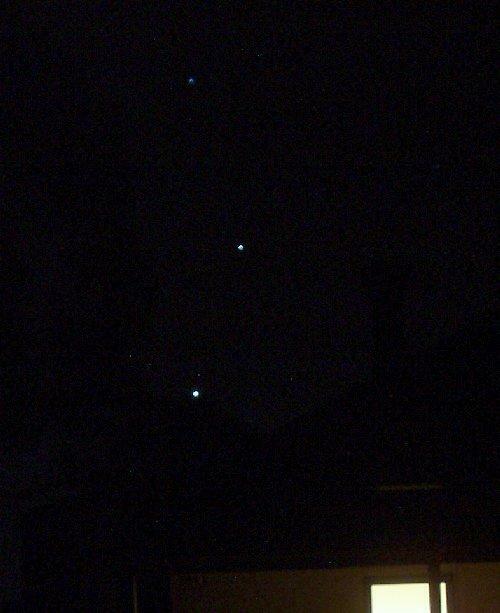 Jupiter and Venus have been slowly drawing towards each other. But over the next week they go from being a bit over a handspan apart, to around a finger with apart. With the bight star Spica forming an attractive triangle with them, they will make a beautiful sight in the western evening sky, during late twilight and early in the evening. 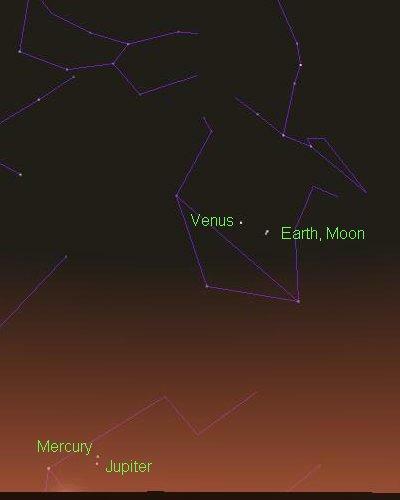 Venus and Jupiterare the brightest objects in the western evening sky, so they will be a bit hard to miss. On August 22 two large M-class flares fired off from the Sun. They produced two coronal mass ejections which should impact Earth sometime between early evening on August 24 (Wednesday) or early in the morning of the 25th (Thursday). 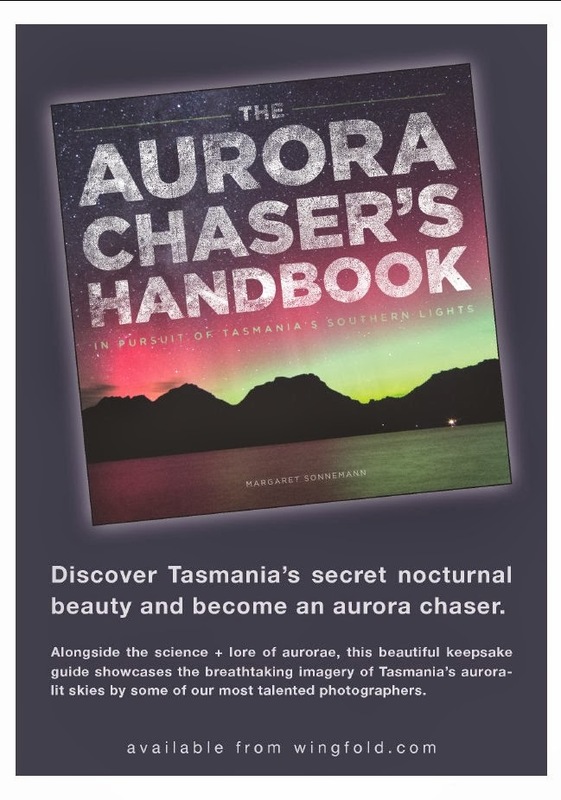 Minor storms are predicted for high latitudes (Tasmania, Southern New Zealand, Australian Antarctic Territories) on these days, and there is a possibility that aurora could be seen from Southern Victoria. Aurora can strike any time, although the best time to look to the south is after local midnight. Aurora may look like a pinkish glow with moving spikes in it when seen from Victoria, not the massive sheets of colour they see in Antartica. Chances are if I said "Hayabusa" to you, you would have no idea what I was talking about (or think I was swearing at you). It's the name of the Japanese Asteroid Sample Return spacecraft. Hayabusa is an ambitious mission to land on the chondrite-type asteroid Itokawa and return with samples of the asteroids surface. Hayabusa is also a well kept secret, while everyone has heard of Deep Impact, this craft is virtually unknown Yet it will actually bring back samples of pristine asteroidal material of incredible scientifc importance for the understanding of the formation of planetry systems. The probe has completed and Earth flyby (see this video) and now has aquired its first images of the target asteroid, in readyness for the landing in late September. If all goes well, the craft will return in 2007 and land in the Australian Outback. 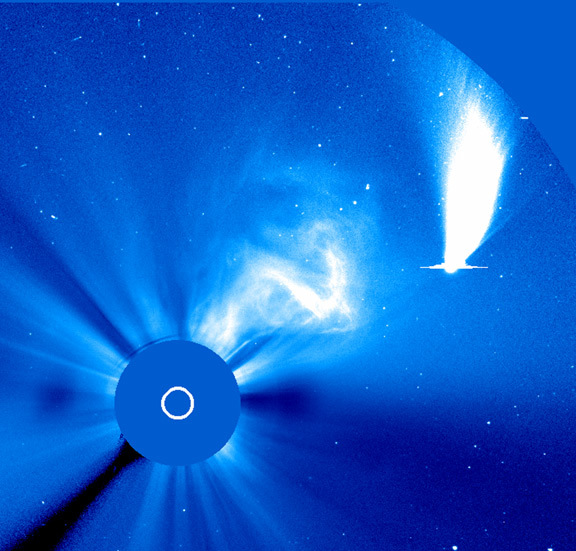 (image credit SOHO, comet NEAT, no this is not the 1000th comet). One of the more unusual aspects of the internet age is using the internet to find comets. The Solar and Heliospheric Observatory (SOHO) keeps watch on our unquiet Sun in a halo orbit around the L1 Lagrangian point 1.5 million kilometers sunward of the Earth. Amongst the instruments are the LASCO coronagraphs, instruments that produce an artificial solar eclipse so astronomers can observe the activity of the corona. I've shown images from this instrument before in connection with aurora watching. Now it turns out that the coronograph is sensitive enough to pick up comets as they pass by the Sun. 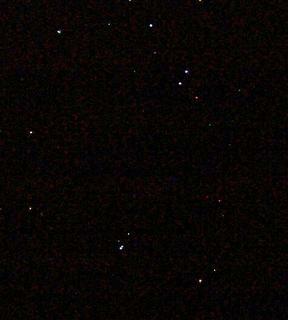 Most are not as impressive as comet NEAT (C2002 V1) pictured above, but quite a few are picked up by the coronagraph. When the LASCO images were made available on the web, amateur astronomer Mike Oates soon spotted 100 comets in the archived images. Many other amateur astronomers soon found that they could trawl the images via the internet and find new comets from the comfort of their computers. Actually, it's a lot harder than it sounds, as most of the comets are faint, you have to do a bit of detective work to sort them out from noise and to get enough observations to get a decent orbit computed, but it is very cool. You can have a go yourself, follow the links here to find out how. (the 999 and 1000th SOHO comets, image credit, SOHO). Originally, astronomers thought that the SOHO craft might pick up a small number of "sungrazing" comets. But then amateur astronomers began combing the LASCO images, and it was soon apparent that there were lots out there, by 2002 500 SOHO comets had been found, and the numbers rose further, until the 1000th comet was discovered on August 5 by an amateur astronomer. Most of these comets are faint, like the 1000th comet itself. Many don't survive passage of the Sun, disintegrating as they pass. And most are part of a few families of comets, which are thought to have arising from the breakup of a larger parent comet. These groups are the Kreutz (85%), Meyer (6%), Marsden (2%), and Kracht (2%) groups. The most numerous group, the Kreutz group, are thought to have their origin in the breakup of a comet in 1106 AD. Subsequent splitting and re-splitting of this comet as it passed the sun resulted in a swarm of fragments that follow similar orbits around the Sun. So who actually won? I'll leave that to Tom to tell you in his post, as he beat me to publishing on the 1000th SOHO comet. Stuart beat me to this (hey, I've been trying to finish writing grants okay), so I will send you over to his blog for a selection of great podcasts from Science Week. Pop over to Stuart's latest post, on the extraordinary life and times of a Woomera Radio Telescope. If you want to, you can watch it live throught the webcam (thanks Megan for the link). As you know, Andy Thomas is Australia's Shuttle Astronaut (and the name sake of Smallest One). As part of Science Week we took the younglings to a special show on life in space, and got to hear Andy broadcast from the space shuttle. Exactly WHAT he was talking about is a mystery, The sound quality was so bad that all we heard was crackles and whistles. A bit disappointing since the younglings (well, not Smallest One) were looking forward to it. Next Thursday ABC's Catalyst program has an interview with Andy Thomas that should be easier to listen to. Andy Thomas also did an interview in the Syndey Morning Herald. In it he talks about his feeling on his last mission to space. He also talked about the things he liked. He said one of the highlights of the trip was observing from the shuttle the phenomenon of the Aurora Australis lights south of Australia. "Another very spectacular sight [was] on the night passes when you look down onto the earth below you and you can actually see meteors plunging into the atmosphere below you. That's a pretty amazing thing to see." Now, as an aurora hunter and meteor enthusiast, that's music to my ears. I know I promised Tom to explain why it will take so long for Messenger to get to Mercury, but Margaret provided these marvelous links to the NASA satellite earth station in Carnarvon, WA and the big dish at Tidbinbilla. These above pages to link to Google Maps, which provides high resolution satellite Images as maps. But now there is Google Earth. 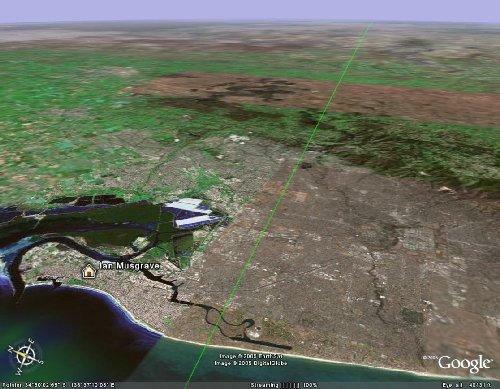 Google Earth also provides high resolution satellite imagery, but with a 3D interface, the ability to add overlays of roads and services, provide bookmarks and make tours. It's phenomenal, and there is even a site Google Earth Hacks, devoted to producing innovative ways to use Google Earth. Mostly geography applications at the moment, although there is a live storm tracker. The down side is that you require at least Windows 2000 or higher, 200 Mb RAM and a broadband connection. It hasn't taken the astronomical community long to find novel uses for Google Earth, the RANZ Occultation section are putting out occultation paths in Google Earth KML format (basically a version of XML). This is seriously helpful. The occultation service puts out good maps, but with the Zoom function in Google Earth you can really be sure of where the best viewing places are in relation to yourself. This can be applied to other astronomical data as well, ISS transit visibility, Southern limits of observations of stars, current sun position and day/night terminator and so on. You can also set up maps of Star Camps, public dark sky sites and do tours of famous astronomical sites, such as Tidbinbilla. Here is a link to my first KML file that hovers you above Tidbinbilla (the source of the above image). When I work out how to make tours, it will take you to Parkes, Canarvon, Mt Stromlo, Siding Springs and Woomera (and maybe even bounce over to Manchester to visit the Woomera dish there). Yes, I know I'm also writing these celestia files as well, so it won't happen Real Soon Now, but an astrotour is on its way (any requests from you folks for a world wide astrotour?). Of course, there are downsides to the high resolution satellite maps, anyone armed with your address (or precise Latitude Longitude) can see your house and backyard via Google. This may become a new form of vouyerism. Also, there have been calls to censor Google Maps in sensitive areas that might be terrorist targets. I can see that the arguments will rage back and forth, but in the meantime, enjoy Google Earth and its uses for astronomy. Google even does Latitude Longitude searches. Type 34d 48' 58.6"S, 138d 29' 59.86"E into the search box. You won't see me waving from my backyard though, unlike every other part of Adelaide, we are in low resolution, and you can barely see the streets. Could be just a bad satellite pass, couldn't have anything to do with the Naval Facility up the road. (image credit NASA) Well, Sunspot group 792 has rotated off the face of the Sun without producing an auroal event here on Earth, and the two sunspot groups currently visible are small and not particularly active. So I thought I'd set up a link to an Aurora Australis seen from the ISS in June 2003. Pop over to the Space Station Picture of the Day for more details and an nice movie. A tip of the hat to Margaret for the link. (Image credit NASA) The crew of the International Space Station sent special greetings last Sunday to NASA's Tidbinbilla Deep Space Communication Complex near Canberra to mark its 40th birthday. 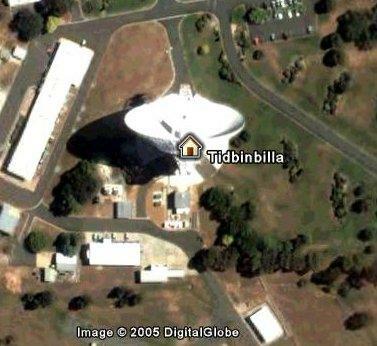 The dishes just outside of Canberra have been monitoring spacecraft for NASA since 1965. They include the largest stearable dish in the Southern Hemisphere (which can survive 160 km/he winds) and still give a daily call to the voyager craft. See this ABC story for more details, and the offical NASA site for its history (and that of the whole Deep Space Network). Any old bits of the Tidbindilla complex wind up your way Stuart? 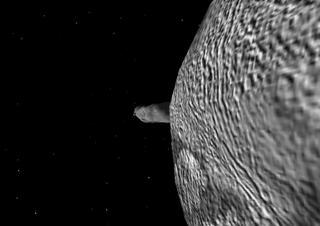 This is an image of (87) Sylvia and its moon Remus, as seen from the surface of Sylvias other moon, Romulus (click on the image for a full size version where you can actually see Remus). The image was generated in Celestia from a hand-rolled Celsetia descriptor file. The orbital elements for Sylvia came from the MPC and the Johnston Archive, with a little help from a Wikpedia entry and the table from the Nature paper on Sylvia and her moons. The table is free, but the paper requires subscription. I used the Celestia surface map for Ida as the template for Sylvia (they are not too disimilar as being roughly potato shaped). My next mission is to watch an eclipse from the surface of Sylvia. 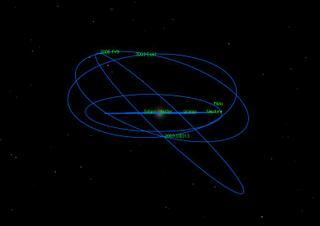 After that I have to fix the orbit of 2003 El61, then set up the planet around the triple star system. Again, if anyone wants the ssc files for this asteroid and its moons, please ask and I'll send them on (along with the ssc files for UB313 etc.). I haven't forgotten about the Celestia tours, I'll finish them in a little while. (Image credit BOM) As I write, the boys are asleep in bed (except MiddleOne, who is asleep in the small tent erected in their bedroom), the Bettdeckererschnappender weisle is out at choir practice, getting ready for next weeks concert...and rain is hammering down outside. The forecast hail has not yet arrived, and may have missed the coastal provinces. This means that I have missed the occlutation of sigma Scorpii, and the near miss of Antares later tonight is out of the question. And the weekend started out with such promise. The vice Chancellor had emailed us to say the weather forecast for Sundays Open Day was good (and by the way, the survey that ranked us 36th out of 38 Universities in teaching quality was flawed). Friday night I wandered out into the night after the special news report on why we ranked so badly (a slightly shell shocked Minister repeated that the rankings were flawed). 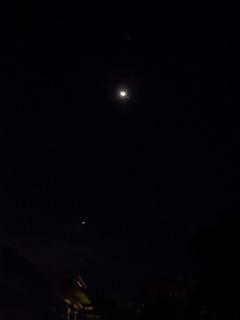 The sky was brilliantly clear, I could see the Milky Way with uncharacteristic clarity, even the dust lanes were clear. 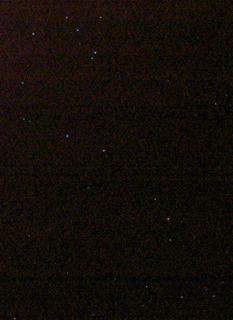 I took a quick snap of the Southern Cross (click on the image for a larger, more detailed version). Sadly, I can't control the exposure, the maximum I can get is around six seconds under dark skies. This image compares favorably with one I did at a dark sky site about a month ago (I still have to blog that trip), but you can't see the Jewel box, or any interesting clusters, but the colours of the brighter stars are visible. Saturday night was clear with some fluffy clouds, I thought about getting my scope up and doing some Moon shots, but elected to watch the final episode of Dr. Who and Steamboy instead. Steamboy was supposed to be a feel-good pick-me-up after the scary (but absolutely fantastic) Dr. Who finale (In space, no one can here you say "EXTERMINATE"), but it was a quirky, dark and morally convoluted tale about the use and abuse of science. Even the spectacular animation and amazing steam contrivances didn't bring cheer as the protagonists tried to sort of how science can be used for good or evil. To top off the evening, the weather forecast for Sunday had turned from nice to nasty. So on Sunday I was out in a Marquee in the forecourt, trying to convince bright young things that enrolling at our University was a great idea, (being 36th worst at teaching not withstanding) while the marquee groaned and shuddered in the wind like a windjammer flying before a storm. The sad thing was that so many of them were just after vocational training (or entry into medicine). A number of them expressed uncertainty about what aspect of science they should choose. "What excites you?" I ask, "what have you recently read or seen about science that has made you go 'Wow!'" "Ahh, I dunno, nothing" they reply. That is just so sad. Why are they doing science if it doesn't strike a chord in them. Perhaps influenced unduly by "Steamboy" I expected people to be passionate about science, to be doing it because they expected to do good for the world through it (or on the dark side, to gain power and money through it), but existential wishy washy-ness? Who expects that? But I did come across some kids who were interested and excited by science, and had some good rousing conversations with them and their parents (even if they didn't want to enroll in our course, who cares, science is FUN). There are a few kids going to bed at tonight knowing that they are not alone, and that liking, even loving, science is okay (and one whose request for a telescope was bolstered by my explanations of how much a telescope meant to me as a teenager). These kids set your heart singing. I was a trace saddened about the number of people who thought pharmacology was Pharmacy (or the number of people who had no idea of the existence of Pharmacology). We soon pointed out the difference, Pharmacists dispense drugs, Pharmacolgists find new drugs (or work out better ways to use old drugs, or work out when it is best not to take drugs - My Masters was on stress and high blood pressure trying to get a handle on non-drug treatments for mild high blood pressure). A large number of people also treated the entire concept of drugs with a shudder. Drugs, even therapeutic drugs, are seen with distaste and dismay, as if they pollute our bodies. Yet these people generally drink wine. Alcohol is a drug, but many people ignore that, but there is more. A glass of red wine or two (but not much more [depends of body mass]) is actually recommended for improving your heart function and reducing the risk of Alzheimer's disease. The antioxidants in red wine are responsible for this (and it was Pharmacologists who worked this out), so we can use red wine as a drug to improve our health (in moderation of course). People who by energy drinks with Gurana, under the impression that they are avoiding polluting their body with drugs, are indeed getting drugs, Gurana is mostly caffeine (and people buying coffee and guaran drinks are just getting expensive caffeine). I had as my prop for a can of energy drink which I used to get people to think about drugs, many people were also carrying around bottles of water plus, water with added vitamins, expensive waste of time water, but that also allowed me to discuss the concept of drugs and try and shatter drug myths. I am a great fan of public science outreach, as a scientist my research is funded to some lesser or greater degree by the public, and I feel it's important that people get some degree of information back in return. While most people were there to find the best place/course for their children to enroll, I added to their experience by explaining some of the latest research about reducing the risk of heart attack and Alzheimer's disease (modest exercise, lots of green leafy vegetables to keep your folate levels up, modest red wine consumption) as a means of explaining what it is that Pharmacologists do. They hopefully came away not only with the impression that our Uni and our courses were great for their children's careers, and that science itself was a Good Thing (tm), but with a better understanding of the role of pharmacology in their lives. Drugs are entwined in our lives in many ways, from being naturally in the food we eat, to being in "smart foods" that we use to try and boost our abilities, to influencing public policy (eg do we support new cancer treatments that are very effective, but very expensive, from the public purse). So if I can help people understand what drugs are, how we use them, and how we develop them, I hope I have gone some way to empowering them, as "consumers" and voters in a democratic society where many decisions turn on public understanding of science. The Mars Reconnaissance Orbiter has successfully been launched. The ESO press release of the trinary asteroid system (87) Sylvia is now available, with photos and animations. See Tom's Astronomy Blog for some nice thoughts on this system. UFO Skeptic Philip Klass has died and our world is a little poorer. See the Bad Astronomy Blog. The Perseids are a reliable northern hemisphere meteor shower where observers may see about a meteor a minute. In the Australia, the point of origin of the shower lies very close to the horizon, below it if you are south of Brisbane. Nonetheless, even though we see few meteors, the sight of the occasionall meteor streaking up form the horizon is fantastic. The image shows the northern sky around 4.00 am on Saturday 13 August, the best time for us southern hemisphere types to see it. The stylized meteors are greatly exagerated in brightness, they will be much dimmer than that. 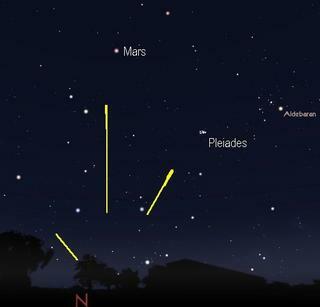 So if you rug up and go out between 3.00 am and 5.00 am you may see something nice (and Mars, the Pleiades and Hyades will be good to look at anyway). The Australian Federal Education Minister Dr. Brendan Nelson (a medical doctor) has given qualified support for teaching Intelligent Design Creationism in high schools. This has been blogged at Evolving Thoughts and Larvatus Prodeo. The main point is that Dr. Brendan Nelson supports the teaching of intelligent design creationism alongside evolutionary theory. basic science in terms of the evolution of man, but if schools also want to present students with intelligent design, I don't have any difficulty with that. It's about choice, reasonable choice." admit that ID is not a scientific theory (see the Kitzmiller files warning, BIG pdf), the reasonable choice is to not teach ID in Science class. However, Dr. Nelson doesn't say where ID should be taught. To be fair to Dr. Nelson, he did make these remarks in questions after a presentation to the Press Club (ironically about Science Week), so his replies may not have precisely reflected what he intended. We will have to wait to see if he clarifies his position, and makes it crystal clear that ID should not be taught in science class. This is a bit of a PR coup for the ID promoters. His remarks have delighted the Campus Crusade for Christ, which is distributing the ID propaganda DVD, "Unlocking the Mystery of Life". I never expected to have to confront ID creationism in Australia, and one of my aquantainces said that Dr. Nelson was too canny to let the ID people in. But it looks like the ID folks are here now. 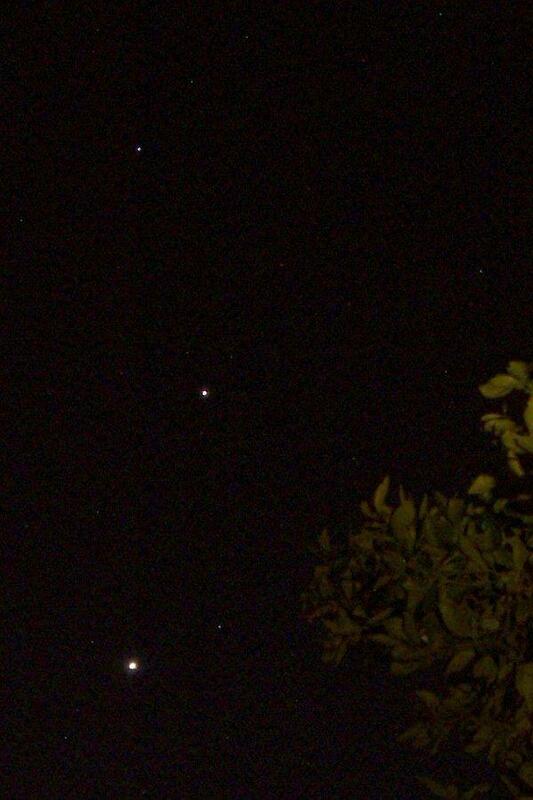 A brief interlude between rainstorms allowed me to see this beautiful arrangement of planets. 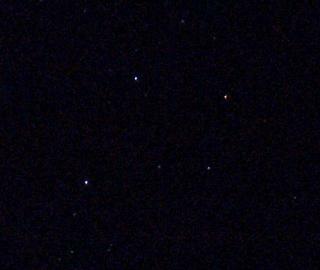 A touch of high cloud is over the Moon, which rests beside Jupiter (nearly invisible in the thumbnail). 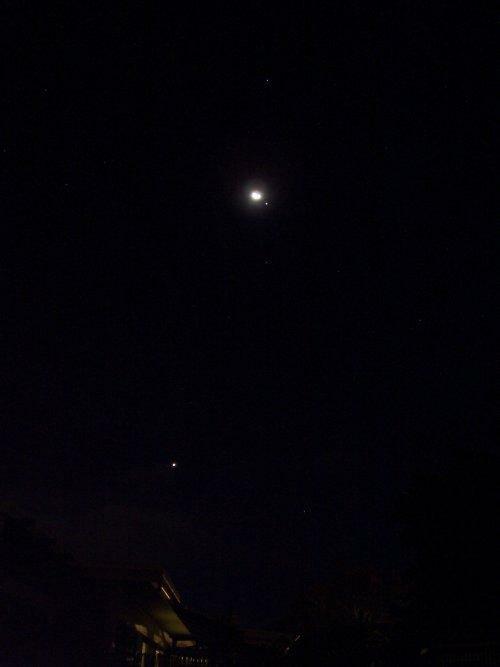 Below is bright Venus, above Jupiter and the Moon is Spica (invisible in the thumbnail). A tranquil moment. As usual, click on the image to enlarge it. I normally don't post about Intelligent Design (ID) and all that here, all my in depth biology blogging gets done over at the Panda's Thumb (and rarely, as I take so long to research and write those sorts of article). But in the light of the Campus Crusade for Christ trying to lobby politicians, religious leaders and scientists in an effort to get an ID propaganda DVD, "Unlocking the Mystery of Life" distributed to every high school for inclusion in the Science Curriculum (see this link for the text of an article in the West Australian about it, of if you have a subscription, you can see a similar article in Saturday's Age), I thought I would pass on this bit of news. ID tries to promote itself as "science" (even though ID promoters do no original research), and to that end uses the term "designer" when talking with politicians and the lay public to try and give the impression that they are not identifying the designer with God, even though they do so when speaking to conservative Christian groups. ID promoters complain loudly and often that they are inappropriately labeled as Creationists. But they are Creationists, there is a court case going on in the US now over the teaching of ID in schools. Documents recently released during preparation for the trial have revealed that ID was a strategic rebadging of plain vanilla Fundamentalist Christian creationism. The details are in the plaintiff's brief opposing the teaching of ID (WARNING HONKING GREAT PDF file), over at the National Centre for Science Education. Brendan Nelson, our Federal Education Minister, has been given one of these DVD's and apparently supports their distribution, so this unmasking of ID is timely. Bad Astronomer Phil Plait and biologist PZ Myers were on the BBC radio program Five Live this morning. Due to a mix up in PST, EST and UT translations, I missed most of it, but caught the end of Phil's. Very good it was too. You can catch up on Phil's experience and PZ's experience on their respective blogs. The radio program is archived in RealPlaer format here, so you can hear their dulcet tones and compelling arguments for yourself 9and there is an overall space theme so it's worth listening to the lot). 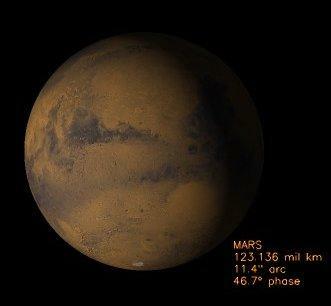 The Mars Reconnaissance Orbiter will lift off at around 9:00 pm August 10 ACST (that is about 11:30 UT). This massive probe will map the surface and environment of Mars in unprecedented detail, with a specal emphasis on water. You can watch the launch online. Discovery has landed safely at Edwards Airforce base after bad weather prevented it landing at Kennedy Space Centre in Florida. We can all breathe a sigh of relief now. An album of Discovery photos is here. Full coverage at the NASA site is here. A rather pretty sight coming home tonight. As usual, click on the image to enlarge. The trinary asteriod link is fixed. This is an image of Ida and Dactyl (source NASA/JPL) as the images of (87) Sylvia and its moons are still under embargo. While many asteroids apear to have a companion, (87) Sylvia is the first to have two moons observed. 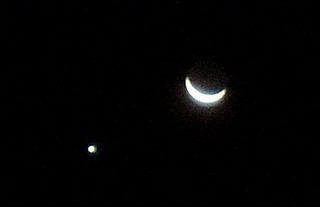 The link to the story on (87) Sylvia and its two moons has been fixed. Sylvia, approx 300 Km across has two tiny moons 7 and 18 Km across. They have been named Romulus and Remus. An animation is available at the ESO site (WARNING 13 Meg file). Looks like another Celestia file to make. The Bad Astronomer and biologist PZ Myers will be interviewed on BBC radio on the recent outbreak of Intelligent Design Creationism in the US. The broadcast is 6.00 pm US eastern time. That's 22:00 UT or 7.30 am Tuesday Morning ACST or 8:00 am AEST. Go have a listen. In the meantime ID creationists in Australia are lobbying politicians to include ID propaganda in the Science Curriculum. I've written an opinion piece on this. If it gets published, I'll let you know. Due to storms in Florida, the Shuttle return has been delayed 24 hours. 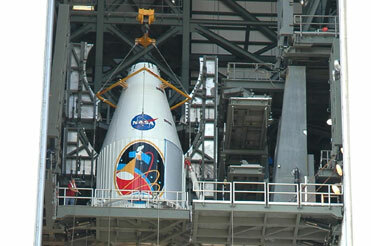 The Space shuttle Discovey (mission SST-114) returns home tonight at 615 pm local time. Despite a successful space walk to fix errant gap fillers, there is still some anixety about the landing, and the family of Andy Thomas, the South Australian astronaut will be watching nervously. There should be no worries, but everyone will feel safer when they are on the ground. An asteroid with two moons! News just in is that (87) Sylvia has two moons. 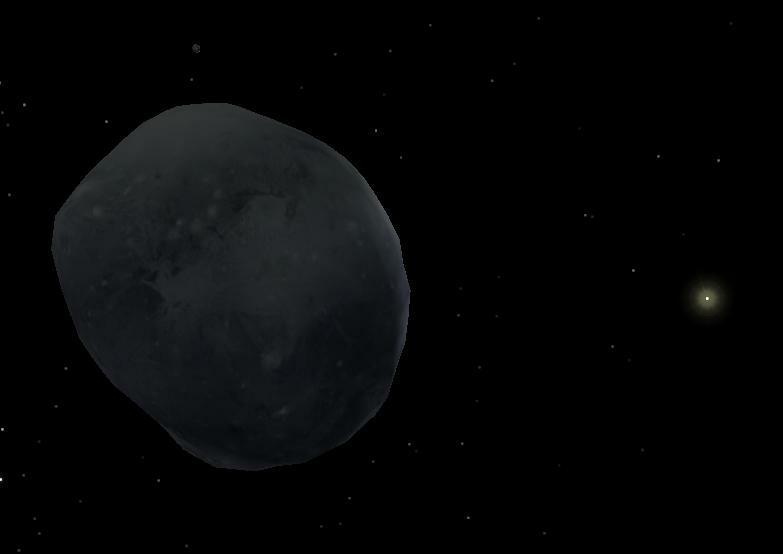 Several asteroids have been reported to have a single moon, but this is the first double. Unfortunately, the link at the RASNZ Ocultation sections pages doesn't currently point to the promised article, but they may fix it shortly. 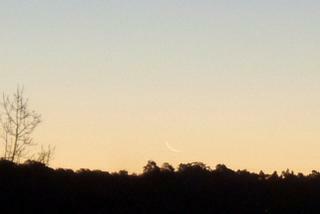 The image to the left is a bit unpreposessing, but it is the earliest crescent Moon I have ever seen. 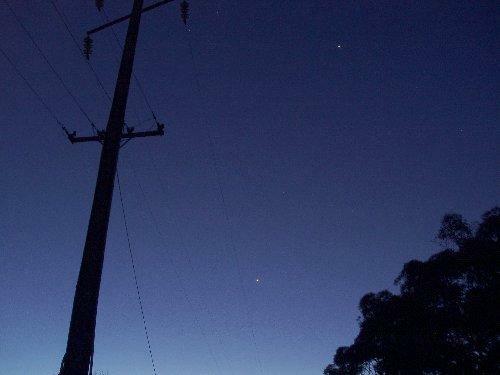 A mere 30 hours old, the glowing chip could just be seen floating over the Adelaide Hills (click on the picture to enlarge). Chez Reynella went for an overnight stay in the Hills at a bush Youth Hostel with some friends. We walked in the bush, tried to photograph carnivorous Sundew plants (unsuccessfully) and failed to spot any Kangaroos (or any other bush creature, six overexcited youngsters have a habit of scaring things away). Come sunset I took the kids out to watch the ISS pass by Venus. We didn't see the ISS, but we did see the just-a-bit-over one day Moon and Venus and Jupiter (the second picture shows Jupiter at the top and Venus at the bottom. Click to enlarge. Note the scenic telegraph poles. Miles and Miles of bush and the only clear spot was full of telegraph poles). Now, you may be surprised to learn that I have never seen a just one-day-old Moon before. But in my various habitations, landscape gets in the way. Even at the bucolic Chez Reynella, with the sea just over the hill, the combinations of circumstances have never been right for seeing an early Moon. Later we rugged up against the cold and went night time possum spotting, despite the industrial strength torches we carried, nary a possum could be seen (probably hear the kids screaming "where are you possums" and run off). Later, I showed the kids the centre of the galaxy. "Boring", declared one kid "all the stars look the same". Still haven't got that paper. When I do, and I fix 2003 EL61's moon, I'll make a Celestia script that will fly you past these new TNO's. Promise. Pop over to the Bad Astronomer for the new theroy of the origin of the Universe. The Flying Spagetti Monster. Don't be too soon to laugh this off, over at the Panda's Thumb it is revealed that The Flying Spagetti Monster has a PR agent. Almost 15 minutes of fame. 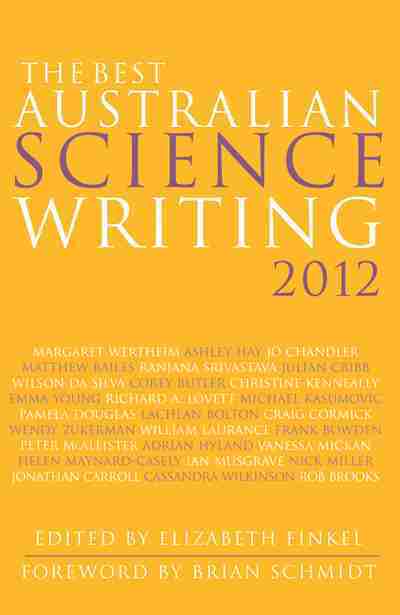 One of my sins is that I am now the new planetary correspondent for the Australian Sky&Space magazine. There is an interesting difference between being an electronic author and a print author, and a whole bunch of new responsibilities. Today the editor rang up. Would I be interested in being the Sky&Space representative on a channel 7 team covering the shuttle discovery re-entry on Monday (Astronaut Andy Thomas being an Adelaide boy, this re-entry is quite significant to us). Would I? I rang off, rapidly checked that I had no commitments that evening and rang back saying yes! About two minutes later the editor is back. The producer has decided that the event must occur in the Sydney News room. Oh. Oh well, I was part of a TV team for around 2 minutes. I was a trace dissapointed, and would have rather liked to be involved. Not just to get my hirstute mug on TV, but because it would have been an excellent educational and outreach opportunity. On Sunday the boys and I are going to a lecture on space exploration, part of the Science outside the Square events started by Adelaide's Thinker In Residence, Baroness Susan Greenfield (an inspiring person who happens to work in a similar filed to me). Hopefully we will have a live hookup to speak to Andy on the shuttle. I could have helped bring some of the ideas in this forum, and some of the passion I have for Australia's history of space exploration, to bear on the current flight. But it was not to be. I'll follow the re-entry as a passive spectator. There is still some worries about a small tear in the protective fabric near the command window, but NSA engineers believe that the shuttle is safe to return home without attempting another repair mission. I believe their assessment, but that won't mean I will be free of any twinges of worry on Monday night. Andreas Kunz and Thomas Schwarz, AAW Darmstadt, we see the ISS and the shuttle Discovery passing near some sunspots. Click on the images for full sized versions. (images reproduced here by kind permission of AAW Darmstadt. Where's 2003 EL61 (and 2003 UB313 and 2005 FY9)? Over at Stuart's Astronomy blog is a nice spotters map for 2003 EL61. 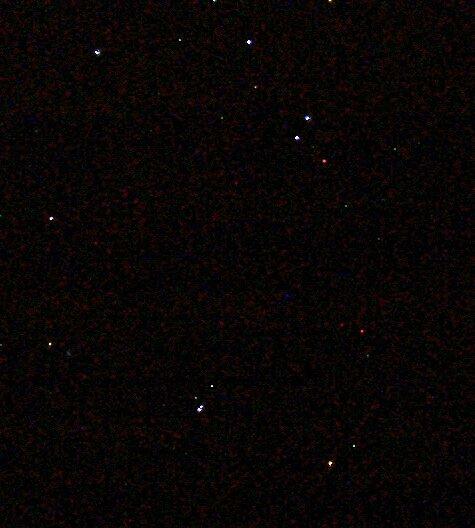 WHile 2003 EL61 and 2005 FY9 are relatively brignt so that amateurs with big telescopes can see them, they are in the constellation of Coma Bernices. This is very low to the horizon for most of Australia. 2003 UB313 is in Cetus, and quite well placed for Australian observers, although at magnitude 18.8 you will need a grunty scope. 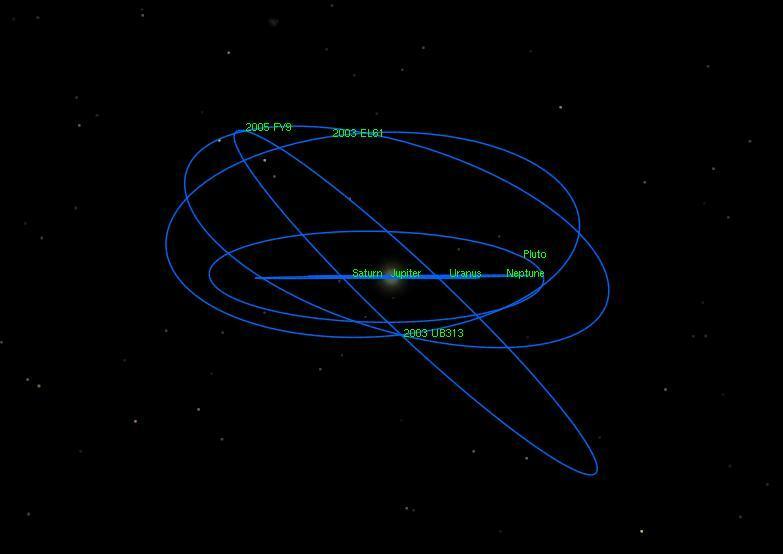 The next image shows the three new transneptunians with repect to the orbital plane of the planets as seen form 150 AU away. You will need to click on the image to see the detail. This gives you an idea of just how tilted they are. [update] Sat 6 Aug. If anyone wants the Celestia .css files for these objects, ask me and I'll send them in a couple of dyas. I have to sort out some issues with 2003 EL61's moon, and I need a paper I can't access for a few days. Iterestingly Celestia automatically makes UD313 a planet. think about that IAU. The space walk by astronaut Dr Steve Robinson to remove two protruding pieces of gap filler was successful. All he did was reach out and gently remove the pieces by hand. There was significant anxiety about this spacewalk as Dr. Robinson was out of direct view of observers, working close to the fragile heat shield tiles. Most of NASA's concerns over the safety of the shuttle have been allayed by the successful space walk. Full coverage of the spacewalk is over at NASA's "Return to Flight" web page. The Shuttle astronauts have begun an unprecedented fourth space walk to repair protruding gap filler between the protective tiles on the Shuttles heat shield. This will be a gruelling 7 hour mission, and a spacewalk to the underside of the shuttle has not been tired before. Tom has a detailed explanation over at his weblog, along with some great shuttle wall papers. I would like to stay up and follow the progress of the spacewalk, but I have to crash and get some sleep. I've had several queries about an circulating email claiming that Mars is going to be as big as the Moon to the naked eye in August. It's a hoax, and one that has been circulating since 2003, during the Great Opposition of Mars. 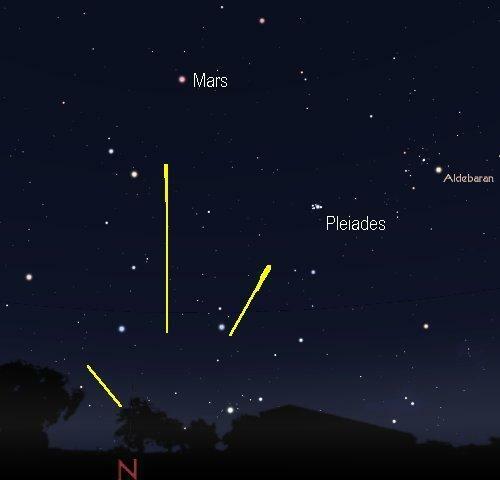 The opposition of Mars in 2005 will be on November 7, not August, and Mars will appear like a bright star to the naked eye, although even small telescopes will reveal a disk and some markings. I've put up my 2005 Mars Opposition page with observing hints, spotter maps, links to interesting Mars sites and an ephemeris for those interested in observing this years opposition. [update] Sat 6 Aug. See Tom's post on the Mars hoax. This Saturdays Adelaide Advertiser had a photo spread of "Andy's Adventures in Space". You would think he was the only Astronaut aboard they way they carry one, even if he is South Australian. Andy's handling of the robot camera helped with the decision that the shuttles heat tiles were okay, but revealed an area where the gap-filler was protruding past the heat tiles. This might cause heating problems of re-entry, so mission control is considering an extra spacewalk to try and fix the problem. Discovery will stay up an extra day. From Stuart and Tom I have just learned of a third large Transneptunian Object. 2005 FY9 is apparently between 50-70% of the size of Pluto, similar to 2003 EL61. For more info see Tom's posts on 2003 EL61 (which has a moon!) and 2003 UB313 which is reported to be larger than Pluto and is now being dubbed the tenth planet. See also Michael Brown's website which also has a wealth of detail on 2003 EL61 and 2003 UB313. The X class flare did produce a billow of charge particles (a Coronal Mass Ejection) but it was aimed away from us. The edges of the CME may brush us, so people in Hobart or Southern New Zealand should keep an eye open for Aurora tonight just in case. 792 may still unleash an auroral storm on us in the coming days. 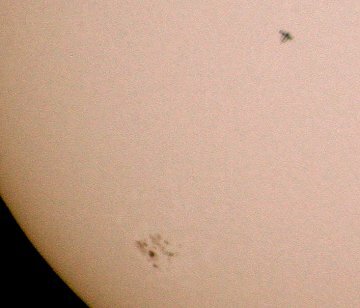 The image acompanying this is a brilliant photo by Shane Finnigan of the International Space Staion hurtling past Sunspot group 792. Every so often, the ISS passes in front of the Sun or Moon, or very close to a bright planet. Watching this is an amazing sight, and I've caufgt a couple of ISS transits myself (not on camera unfortunately). For a dedicated band of people, imaging the ISS when it passes in front of the Sun or Moon is a demanding hobby. This is made a lot easier by Thomas Fly (WARNING BIG GRAPHIC HEAVY SITE, but well worth it), who has produced the ISS transit alert service (This is currently down, but will come back). ISS transits are a bit more work than just ISS passes, but well worth it. 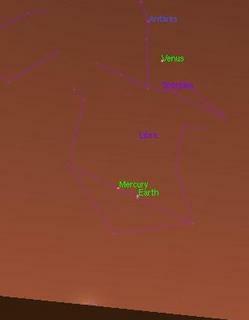 Check out the ISS Transit of Venus page.